How do I upload photos to my SkyDrive? There are several ways to copy pictures to Windows Live SkyDrive. They can be “pushed” up using Windows Live Photo Gallery (see: How do I upload photos to SkyDrive using Windows Live Photo Gallery?) or they can be “pulled” up form SkyDrive. This second method is the topic of this post. Sign in to your Windows Live account. Internet Explorer likely will remember you and sign you in when you go to home.live.com. On your Windows Live home page click on Photos in the menu bar at the top. Click on the album where you want to add photos. If the album does not show, click View all albums in the nav bar on the left. Click Add photos on the menu bar. The “Add photos” page provides for two ways to copy photos to the album. You can drag photos from a Windows Explorer windows, however, this method is not available on all browsers. The other way is to click “select photos from your computer”. An “Open” dialog window opens. This is actually Windows Explorer. It likely will open to a document folder, so maneuver to the correct folder where the photos are. Select the photos to upload in the normal way – click the thumbnail, hold down the Ctrl key to select more. The other ways work just fine. 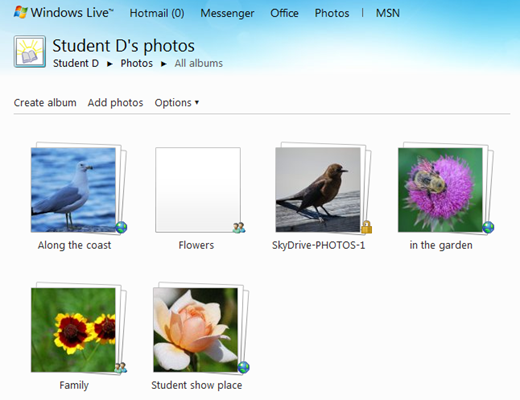 The thumbnails will start to appear on the SkyDrive page. The default size of the photos to be uploaded is “Large (1600 px)”. If you wish the photos to be scaled to another size, or to maintain their original size, select the option by clicking the size button. Click Continue (it will be unavailable until the “Open “task is completed. You will next see a message like at right advising that you are done. 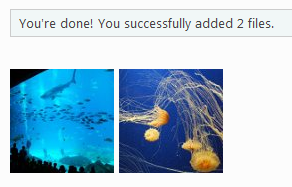 That’s all there is to uploading photos to an album on your SkyDrive. This entry was posted in SkyDrive and tagged albums, photos, SkyDrive, upload photos, Windows Explorer by Ludwig. Bookmark the permalink.